Breastfeeding is a great choice with a boatload of benefits: it lowers your baby’s risk of asthma and allergies, helps you bond with your baby, and can even help him gain the right amount of weight as he grows rather than becoming overweight. In general, coffee—and caffeine in general—can have a lot of unwanted effects as you breastfeed. Here are a few reasons why you and your baby will both be happier with coffee out of the picture! Lots of babies are caffeine sensitive, but if you made the choice to mostly or completely avoid caffeine (possibly link to coffee during pregnancy post) during your pregnancy then chances are, yours is extra sensitive to the stuff right now. Caffeine sensitivity shows itself in babies in many of the same ways it does in adults. If your baby is caffeine-sensitive, he will be overstimulated, hyperactive, and probably a little fussy. Some babies (although this is more rare) experience caffeine headaches. For caffeine-sensitive babies, even a tiny bit of caffeine is too much. Watch out for “hidden” caffeine that could be setting your newborn off: tea, sodas, chocolate, and certain medications, to name a few. That’s almost forty times longer! Premature babies can take an even longer amount of time. This is pretty bad news if your baby does happen to also be caffeine sensitive, because a half-life of three to four days means it can take a full day or two for her to calm down after having a little caffeine through breastmilk. Once your baby reaches three to five months of age, that three or four days drops down to around fourteen hours. Still a long time when you compare it to how long it takes us! Coffee won’t actually decrease your breastmilk production (that myth has been busted). That said, we probably don’t have to tell you that babies who are fussy and overstimulated from caffeine definitely don’t nurse as well! When babies are really upset, it can be hard to calm them down enough for them to breastfeed. This can, in turn, lead to a decreased milk production over time. This is due to decreased nursing and not the caffeine itself, but it makes a lot of sense to go right to the source and eliminate the real cause of all that fussiness. Coffee in breastmilk is a possible cause of acid reflux and colic. Hopefully you’ve never had to sit up all night with a baby experiencing these symptoms, but if your baby is prone to acid reflux, it may be worth looking into whether or not caffeine is the culprit. Coffee is a common allergen in babies, which means it can be upsetting for their digestive tracts. Other common allergens include gluten, citrus, nuts, eggs, and soy. And while we’re on the subject, caffeine can also be a trigger for colic symptoms. Colic is one of those things that can make a mom feel so helpless and frustrated. It might be worth it to see if cutting out caffeine eases some of the symptoms. Newborns need their iron! If they don’t get enough, they can show symptoms like slow weight gain, pale skin, no appetite, and yet more irritability (it’s starting to look like drinking caffeine = grumpy baby!). The good news: breastmilk naturally contains the perfect amount for them. The bad news: studies show that women who drink a few daily cups of coffee while breastfeeding tend to have a full third less iron in their breastmilk than women who do not drink coffee. That means that the more coffee a breastfeeding woman drinks, the higher the chances her baby won’t get enough iron. That can lead to iron deficiency anemia. And unfortunately, it’s not quite as simple as switching to decaf because the iron loss is the result of certain acids found in coffee and not the caffeine itself. So what is a good alternative? Who needs to drink coffee while breastfeeding when we have SUTRA? All of the ingredients found in SUTRA Gold are great for you and your baby as you’re breastfeeding, but the top three ballers are ginger, turmeric, and coconut milk. Ginger can give your breast milk production a big ol’ boost! It’s one of the best foods out there for promoting milk production. It also helps relieve sore throat and coughing. If you have any issues whatsoever with nausea or pain, it does wonders for both. On top of all that, ginger is great for your immune system. And the less you get sick, the lower the chances are of your baby getting sick! Like ginger, turmeric is an immune booster. Turmeric has antifungal, antibacterial, and antiviral properties, making it pretty great to have around during flu season. It also fights inflammation—good news for those of you out there suffering from painful, swollen breasts during breastfeeding. According to this study, turmeric is highly effective in fighting off pain and inflammation. You’ve for sure heard about the coconut craze by now, but it lives up to the hype! Not only does it promote milk production, it increases the capric and lauric acid found in your breastmilk, which gives your baby an immunity boost (Noticing a pattern yet?). Some breastfeeding moms experience indigestion or constipation, and coconut milk is an effective remedy for both. Good news for the hot cocoa lovers out there—SUTRA Black is another fantastic option for breastfeeding mothers! We already talked some about the benefits of coconut milk, which is also found in SUTRA Black. This drink also packs the extra punch of activated charcoal and cocoa. Activated charcoal is not excreted in breastmilk, so you don’t have to wonder about the effects it can have on your baby. All you have to think about is its effects on you! And, don’t worry, these effects are all positive. Activated charcoal helps eliminate toxins from your body, reduces brain fog (really great if you’ve decided not to drink coffee while breastfeeding! ), and improves your digestion. Cacao gives you that little added boost of energy that’s so great to have on those early mornings. It also contains small amounts of something called Theobromine, a compound known to stimulate breastmilk production. In short, the answer to “Should I drink coffee while breastfeeding?” is that it’s much better not to. 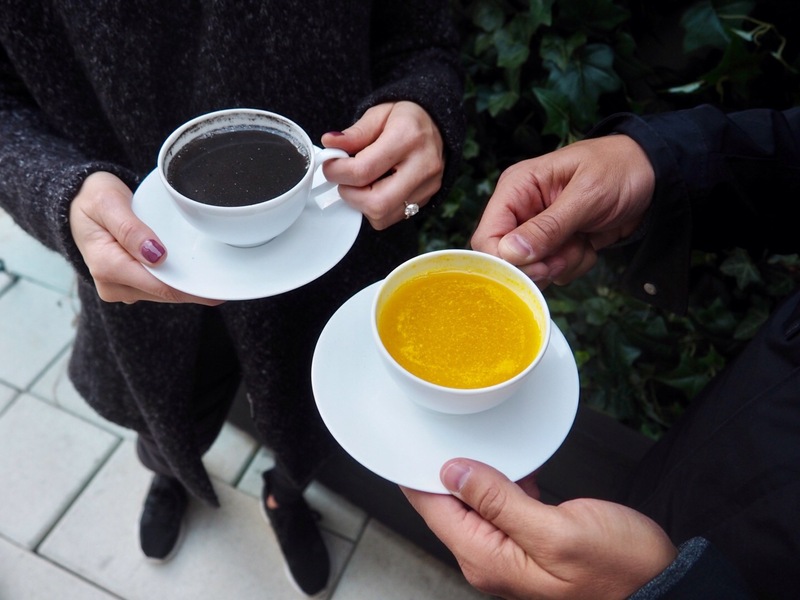 Try switching out your morning coffee for SUTRA Black or Gold for a week or two! You might be surprised at the effect it can have on your baby.